The footage shows the gator rolling around angrily after being pulled out of the water. A conservation officer filmed the dramatic capture and removal of an alligator that was over eight feet long from a campground in the American state of Alabama. 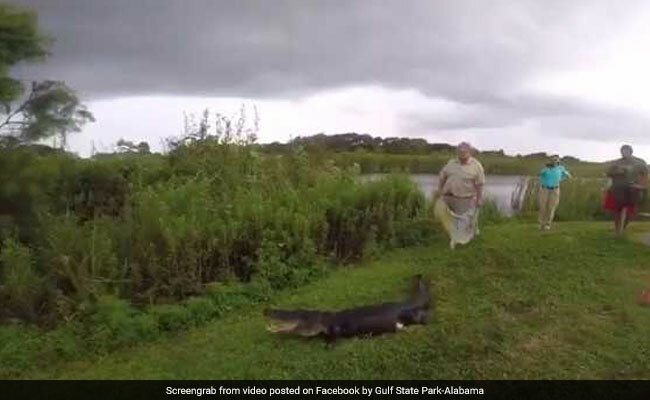 The footage shows the gator rolling around angrily after being pulled out of the water. The officers emphasise the large reptile was simply relocated to a different area - far from humans - and not harmed in any way. Writing on Facebook, one of the officers explained that the gator had become a nuisance for campers in the area. People had been feeding the alligator which caused it to stay near the campground. Feeding alligators is illegal, reports KWRG. Officers emphasised that the alligator was not harmed in the removal process and was simply moved to a different area. "We caught this 8 1/2 ft bad boy today," Landon Coker wrote on Gulf State Park's official Facebook page on Wednesday. "We removed this gator for the safety of guests and visitors inside of Gulf State Parks Campground. This gator was becoming a nuisance due to the amount of people feeding him. Once you feed a gator they either have to be relocated or dispatched." "We relocated this gator to an area where he will have a very slim chance of making contact with humans," he added. The video shows the alligator being restrained and transported to a different area where it is released into the water.